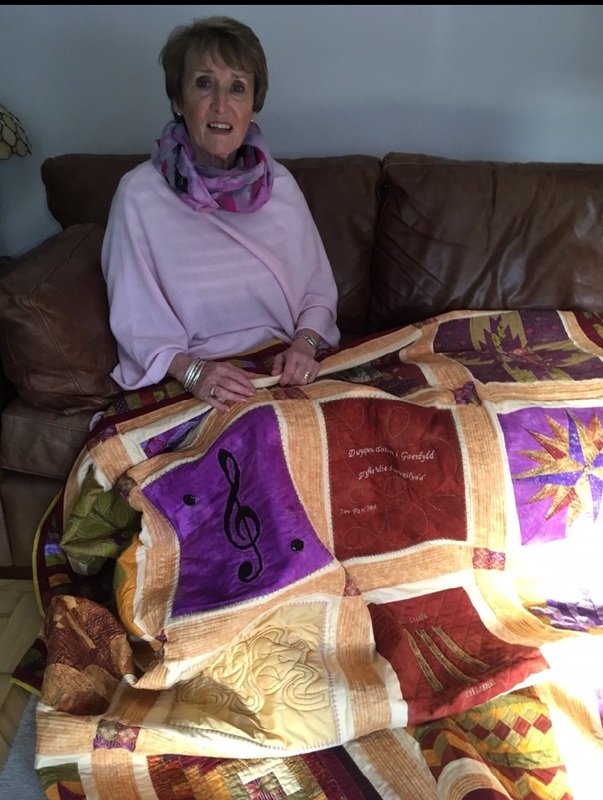 The past few months have been a very busy time for Marian Evans from Cardiff, as she has been hard at work creating a unique quilt to celebrate the fact that the Eisteddfod is returning to Cardiff for the first time in a decade. But this is no ordinary quilt. Some of the elaborate panels represent different elements of the Eisteddfod, with everything coming together to create a beautiful artwork which took almost five months to complete through a combination of machine work and hand stitching. Marian says, “I wanted to do something a little bit different to mark the Eisteddfod’s visit, so I decided to create a brand new quilt. “I have been quilting for many years and am lucky enough to be invited to talk about my work in different parts of Wales. It’s been a pleasure to tell them about the brand new Eisteddfod quilt over the past few months. “The colours are based on the Eisteddfod logo, and it has 16 colourful panels, with four of them representing elements of the festival. The treble clef represents music, the Gorsedd symbol shows the relationship between the Gorsedd and the Eisteddfod. The former Archdruid, Jim Parc Nest, has composed a couplet to welcome the festival to Cardiff, and finally, the mask, normally associated with the world of drama is used to represent literature and the composition side of the festival.